The seeds for ANSYS were planted in 1970 at a Philadelphia farmhouse. That’s when John Swanson wrote the first version of what is now arguably one of the most robust and popular simulation software solutions in the world. The company’s growth in recent years has exceeded that of the CAE market, and the ANSYS vision is one of pervasive simulation. That vision has been supercharged by the explosion in cloud computing. 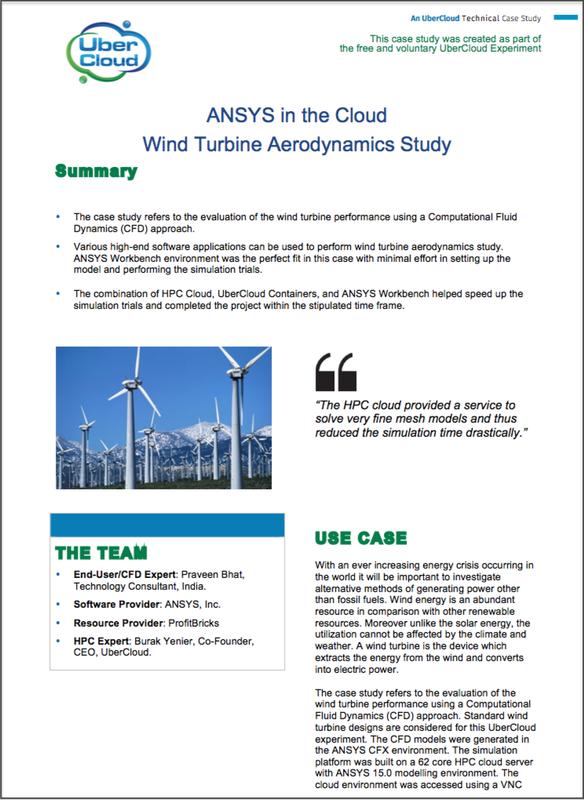 Since UberCloud’s inception, researchers have been exploring the benefits of running ANSYS on the cloud. Below are a few of their experiments. Residential and commercial irrigation products must deliver exceptional reliability; customers want equipment to work every time, with low maintenance requirements and a long product lifetime. Thus irrigation products manufacturers generally employ a large team of engineers for product development, and products go through rigorous pre-production testing. In recent years, the push for greater efficiency and environmental sustainability has introduced a new challenge for these engineering teams: More customers are using untreated water sources (such as rivers, lakes, and wells), which contain fine silt and other debris that can damage the internal components of the irrigation system over time. To prevent product failure, engineering teams are turning to increasingly fine meshes for CFD analysis, outpacing the resources of in-house workstations. To continue expanding the fidelity of these analyses within reasonable product design cycles, manufacturers are looking to cloud-based and remote computing for the heavy computational loads. In this experiment, researchers sought to find that “sweet spot” that balanced user set-up time with computing costs and delivered timely, consistent, precise results. Despite a few challenges during the process, both the researchers and the manufacturing firm concluded that cloud-based software with scalable, short-term licenses would greatly reduce costs by preventing the purchase of under-used HPC packs for the company’s in-house simulations. End users accessed images and animations completely through the internet. Many areas of the world lack access to fresh water, even though they are located in coastal areas. Thus an entirely new industry has been created to treat seawater and transform it into tap water. This process requires water to be pumped into special desalination equipment, which is particularly prone to cavitation, so a correct and precise water flow intake must be forecast before building the installation. Meanwhile, the computational mesh used for simulations must correctly capture the fluid interface, and the number of iterations required to reach a physically and numerically converged solution is quite high. Because the end user was faced with a strict time limitation, the research team opted to use ANSYS CFX software and three of its ANSYS HPC Packs because of its strengths in analyzing complex fluid dynamic systems. Additionally, they used the software CEI Ensight Gold to visualize and analyze the CFD results without the need to download large files over the Internet. The research team concluded that the future for the wider use of supercomputing centers is to find a way to have commercial CAE (CFD and FEA) licenses on demand in order to pay for the actual software usage. Commercial software providers must take full advantage of current and future hardware developments for the wider spread of virtual engineering tools. The simulation above recreates the contours of total temperature for a jet engine component. 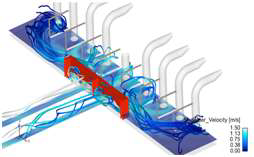 In this experiment, a jet engine high pressure compressor assembly was the subject of a transient aerothermal analysis using the FEA/CFD coupling technique. Coupling is achieved through an iterative loop with smooth exchange of information between the FEA and CFD simulations at each time step, ensuring consistency of temperature and heat flux on the coupled interfaces between the metal and the fluid domains. The aim of the UberCloud HPC Experiment was to link the commercial CFD code ANSYS Fluent with an in-house FEA code. This was done by extracting heat flux profiles from the Fluent CFD model and applying them to the FE model. The FE model provides metal temperatures in the solid domain. This conjugate heat transfer process is very consuming in terms of computing power, especially when 3D-CFD-models with more than 10 million cells are required. As a consequence, using cloud resources offered a means for shortening computing time. The simulation was completed via cluster run about five times faster than it would have been on a Windows PC. Furthermore, thanks to smooth collaboration with ANSYS, it only took one month from the initial idea to the first calculation on the remote cluster—a very short time from an industrial manufacturing perspective. UberCloud’s Compendium of ANSYS Case Studies, 2012-2018, contains 25 different scenarios where ANSYS cloud-based software played an important role. Cases include applications in manufacturing, automotive, aerodynamics, healthcare and more.